…So good they named it twice. We arrive in NYC via JFK around 7:30pm. I’m exhausted, beyond in pain, cuz my knee did not take too kindly to the pressure of being up in an airplane. It seriously took everything out of me to either not bawl like a baby or just pass out from the pain. So, imagine that, I’m kinda not in the greatest mood. Mike wants to take the Subway, and I SOOoooo did not. So, I got my way and we ordered up a shuttle ride to our hotel. Mike should appreciate my grumpiness from time to time. 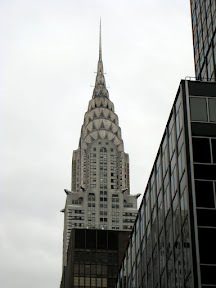 If we would not have rode in that shuttle, we would never have experienced that which is New York driving. OR all the buildings and sites we got to see just on the way. There were a lot of people in the shuttle and I saw no rhyme or reason to how the driver was dropping people off, but I just went with it. I was quite lucky in that I was in the front passenger seat, but Mike was somewhere in the back. I probably looked like a wide-eyed kid looking all over the place to catch every detail I could. I also decided very early in the ride, that the driver did work for a large company that drives people around, so I let go of any anxiety about the zipping around/honking/sudden braking. It was a lot easier than I would have guessed. I think it took us over an hour to finally get to our hotel, but it was seriously worth it. So, we check into Millennium Broadway Hotel, which is so seriously posh. I probably looked like a fool with my mouth gaping open just looking at the lobby area. Very art deco. The actual room itself wasn’t super special, but it was still nice. 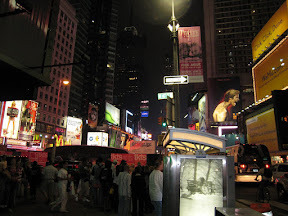 Our view was out onto 44th street just around the corner from Times Square. You could see all the activity out there and the crazy bright lights. Good thing those curtains were so good at blocking out the light. We were so desperate for clean clothes we sent a bunch to get cleaned at the hotel. We obviously weren’t thinking. More on that later. I was completely shot for the evening, but I could see Mike was really raring to go. We were very hungry, so Mike took it upon himself to go in search of some good ol’ New York pizza. I stayed behind and either read or bathed or something. He took awhile, but he finally came back with pie and beverages in hand. We scarfed. We woke up, hit the concierge up for some breakfast recommendations and eat at a diner called The Red Flame. Excellent place. Good, cheap, and fast food. I had an omelet of some sort and I can’t remember what Mike had. I know there was a bagel involved. We go back to the hotel, and try to look where we can buy clothes, cuz we’re seriously gross. I think is the point where Mike went down to the Theatre Desk to see what broadway shows we could get tickets for. I really wanted to see Wicked. There were some others I wouldn’t have minded, but I really really wanted to see Wicked. I had also resigned myself to not having a chance in hell at seeing it, cuz when we looked at available tickets online the only ones available were $400 a piece! Mike gets done talking with him and he says he can probably get some for about $200 a piece, any other show would be about $150. I figure for an extra $50 a pop, it was well worth trying. So, he goes in search of those, and will call us with any news. We also talk to the concierge to ask about restaurants to go to before the show. We want italian. 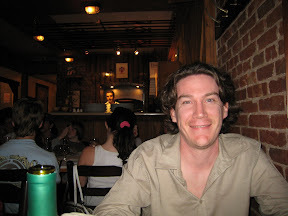 So, he gets us a reservation at a place called Tramonti at 6:00pm. We hop on the NY Subway and go to where we think we can find a place. We didn’t find what we were looking for, but we found an Old Navy and an H&M. Good enough for me. The Old Navy was probably the biggest I’ve ever seen. Take your typical local Old Navy, then stick 2 more on top of it. It was 3 stories of crazy cheap clothes. All the clothes in my department — yes, the “Women’s” area — were 75% off. I didn’t realize that until I went to pay for a pair of pants I grabbed and they were $3.25. Even the lady was baffled and checked with like 2 other people to make sure that price was right. I quickly headed back to the section and grabbed as much as I thought I would like. I think I ended up spending something like $28 for 4 or 5 pants/shorts and a couple shirts. It was crazy. We then headed over to H&M cuz Mike is so above Old Navy (joke!). He found some really nice stuff there. He even ended up buying a new outfit for our Broadway night cuz he wasn’t feeling the one he brought with him. I think sometime while we were shopping Mike got the call that the dude found us Wicked tickets. I was so excited! I really thought we had a snowball’s chance in that hot place. We go back to the hotel to change into our new non-stinky clothes, and then get back on the subway to head towards Ground Zero. It was kind of a pain to get there cuz I got off too early and then we ended up waiting forever for the next train, then the line was under construction so you had to get off kinda far and hoof it. So, we’re kinda rushing cuz we have to get back to the hotel by 5ish to get ready for dinner and Broadway. 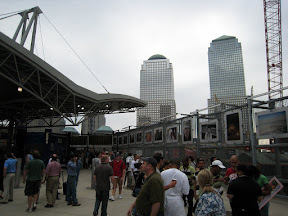 We literally walk at a brisk pace around Ground Zero, check out the pictures & timeline info they have there, and then we get right back on the subway. At the hotel, our clothes from the day before are all clean and pretty. And we think, why did we do that? We just went and bought clothes anyway. REAL silly considering the laundry bill ended up being over $100. What the desperately stinky won’t do for cleanliness. Anyhoo… We are, of course, so late. We get dressed, and start the not-terribly-short walk to Tramonti. Get there about 15 minutes late, but our table is still available. I don’t know if we just didn’t see all the restaurant, but if we did, it was very small – narrow and long and packed with tables & people. We get to our table just in front of the brick oven area and we are greeted by a very energetic friendly waiter with a terrible fake italian accent. But no worries, it worked for me. We order some wine, peruse the menus and my eyes stop on the Gnocchi Alla Sorrentina. I freakin’ love gnocchi. I get it almost anywhere that has it. So, my mind is made up, but Mike wants to get a pizza cuz the concierge says they are to die for. He can’t really seem to decide. So, I suggest we get the gnocchi and a pizza and split both. He likes that idea. Another bottle of wine later, we get our dinner and it just looks delicious, and it was! I don’t think I’ve had better gnocchi anywhere. The gnocchi was fresh, the sauce was fresh. After a couple bites, it dawns on me that only half of this is mine. I have to eat half and then give it up. And! it was MY idea. I wanted to kick myself. But, I finally ate my half and switched with Mike’s pizza. The pizza was really good, but oh! I felt the loss of the gnocchi. Seriously. 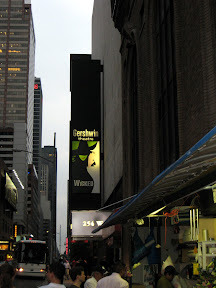 We had some tiramisu to top it all off and booked it over to the Gershwin Theatre. Granted, I’ve never been to any theatre on Broadway, but this sucker was HUGE. Not what I was expecting at all. It seats 1933 people. Yowza. Our seats were on the front row of the second section of the Orchestra section on the left side. Something like 18/19 rows back from the stage. I was in awe just sitting there waiting for the show to begin. It was spectacular. The production value was just beyond anything I could have imagined. The sets were awesome, and the costumes were just unbelievable. Glinda kind of comes across as a bit of sorority girl with a good heart. So, she definitely had use of the costumes. I think hers changed the most & frequently. The play was almost 3 hours in total with a 15 minute intermission. Absolutely breathtaking. 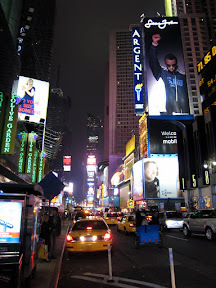 We stroll on back to the hotel through Times Square and I got to truly experience it for all it’s gaudy glory. 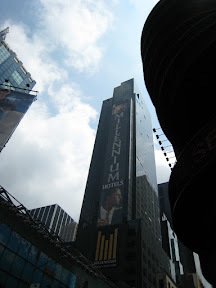 I kind of had mixed emotions about the whole deluge of advertising. While I found it very visually stimulating, it just kinda blows my mind that the area seems so hyped. In general I find advertising completely annoying and overly used, but I could definitely appreciate the uniqueness of the whole display. And the people! You’ve never seen so many people in one place. I’m amazed people can even walk around. The next day we headed downstairs, got another breakfast recommendation from the concierge and had an awesome meal at the Brooklyn Diner. I had “The Mixed Marriage of Irving & Gina” which was a nested egg with peppers, onions, sausage, and polenta. 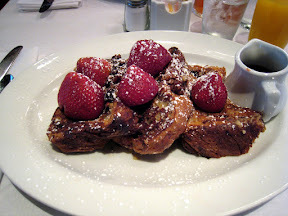 Mike had the “`Tony Bennett’s`Cinnamon Raisin Pecan French Toast”, and I think you an figure out what that one was. Both were beyond lishous, but were also pretty pricey. Well worth the experience, of course. We head back to the hotel, check out, leave our bags with the bellhops and decide we’re going to do one of those bus tours. We loved the Dublin one, so we figure it would be a great way to see a bit of Manhattan before we have to leave at 5:40pm. The tour takes about an hour and a half and hits some pretty interesting buildings/sites. The tour guide was very entertaining which always helps. New York has some very cool architecture. We head back to get our bags, and hail a cab. The bellhop tells us for $20 more we can get a Lincoln Town Car – that includes tolls (cabs don’t) and baggage (cabs don’t either). So, really we probably didn’t pay that much more if any. And it was much nicer than a cab, I’m sure. So, after a very long and arduous process. I have finally completed my tales of travel. Sorry it did take so long, but sometimes the days just get away from you.